Chinmaya Mission® was established in India in 1953 by devotees of the world-renowned Vedanta teacher, His Holiness Swami Chinmayananda. Guided by his vision, devotees all around the world formed the nucleus of a spiritual renaissance movement that now encompasses a wide range of spiritual, educational, and charitable activities, ennobling the lives of thousands in India and across its borders. Presently, headed by His Holiness Swami Swaroopananda, the Mission is administered by Central Chinmaya Mission Trust (CCMT) in Mumbai, India. Under his guidance, the Mission has continued mushrooming across the globe and stands today with over 300 centres worldwide. What does Chinmaya Mission teach? Chinmaya Mission follows the Vedic teacher-student tradition (guru-shishya parampara) and makes available the ageless wisdom of Advaita Vedanta, the knowledge of universal oneness, providing the tools to realize the wisdom in one’s life. Vedanta, the essential core of Hinduism, is the universal science of life, relevant to all people of all backgrounds and faiths. Vedanta inspires seekers to understand their own faith better. Thus, although Chinmaya Mission is a Hindu organisation, it does not seek to convert other religious practitioners. As a spiritual movement that aims for inner growth at individual and collective levels, the mission offers a wide array of Vedanta study forums for all ages, promotes Indian classical art forms and operates numerous social service projects. To date, millions worldwide have benefitted directly or indirectly from Chinmaya Mission’s numerous centres, ashrams, classes, events, services and projects. 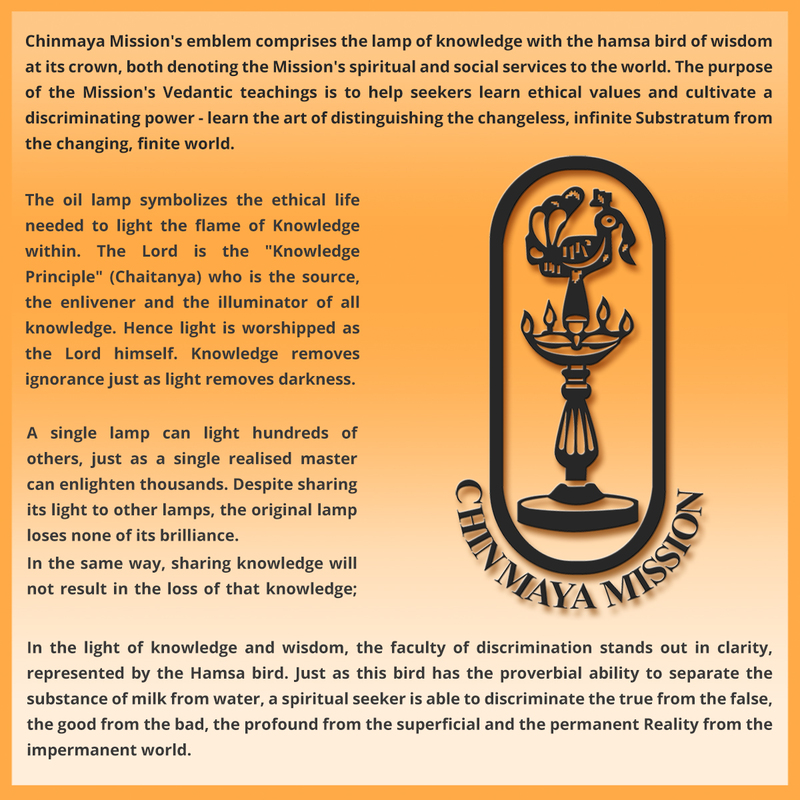 Chinmaya Mission's emblem comprises the lamp of knowledge with the hamsa bird of wisdom at its crown, both denoting the Mission's spiritual and social services to the world. The purpose of the Mission's Vedantic teachings is to help seekers learn ethical values and cultivate a discriminating power - learn the art of distinguishing the changeless, infinite Substratum from the changing, finite world. The oil lamp symbolizes the ethical life needed to light the flame of Knowledge within. The Lord is the "Knowledge Principle" (Chaitanya) who is the source, the enlivener and the illuminator of all knowledge. Hence light is worshipped as the Lord himself. Knowledge removes ignorance just as light removes darkness. A single lamp can light hundreds of others, just as a single realised master can enlighten thousands. Despite sharing its light to other lamps, the original lamp loses none of its brilliance. In the same way, sharing knowledge will not result in the loss of that knowledge; on the contrary, upon giving knowledge, we begin to understand it clearer and it benefits all. In the light of knowledge and wisdom, the faculty of discrimination stands out in clarity, represented by the Hamsa bird. Just as this bird has the proverbial ability to separate the substance of milk from water, a spiritual seeker is able to discriminate the true from the false, the good from the bad, the profound from the superficial and the permanent Reality from the impermanent world. “One who makes an inner resolve and takes a firm decision to follow the path of righteousness should be considered a sadhu”. A pledge is a sankalpa or a vow. It is a decision that helps to bring about an inner transformation. You become a seeker the moment you take a sankalpa or decision. It is this sankalpa shakti which acts as the catalyst that changes an ordinary man into a historic personality. The Chinmaya Mission Pledge is a direct message to us from Swami Chinmayananda. In an inspired mood, Swamiji spontaneously dictated this pledge at a conference of Chinmaya Mission workers in the summer of 1962 at Ernakulam. He said that this pledge would act as a guide to all Mission members and to people in general. This pledge conveys the very essence of the scriptures and in simple words tells us the goal of life and how to live it. This great Mahatma’s life’s message has been summed up in a few simple sentences or aphorisms in the pledge.